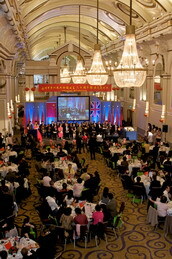 On 20 September 2009, a celebrating party was held at a banquet hall in London by the preparation committee of the Chinese community in UK to celebrate the 60th anniversary of the PRC. Over 500 attendants, including representatives from the Chinese community, Chinese students and businesses in UK and invited guests from the UK parliament, government, businesses and other institutions, were gathered to celebrate the 60th birthday of the People’s Republic of China. Ambassador Fu Ying was invited to attend and address the party. Fu Ying started by delivering holiday greetings to Chinese people living in the UK on behalf of the motherland. She said, it has taken China 60 years to achieve the historic transformation from a poor and week country into one of prosperity and strength. China is the world’s third biggest economy and is expected to be the second soon. The wealth it created in a single day in 2008 was more than the total in 1952. The life of its people has undergone historic changes, from basic subsistence to moderate prosperity and preliminary richness. Illiteracy ratio slumped from 80% to 3.6%. The numbers of internet and cellphone users are 300 and 700 million, both ranking the first globally. On domestic economic situation, Fu Ying said that the financial crisis had had certain impacts on China. However, after one year’s efforts, its economy is gradually recovering. The government’s stimulus package is focused on improving people’s livelihood, expanding domestic demand, restructure economic growth and facilitate sustainable development. Fu Ying said, we are also clearly aware of the existing gaps. For instance, China’s per capita GDP still ranks below 100th globally. It still faces tremendous constraints in population, employment, resources, energy and environment, all making development a long-term and daunting challenge. 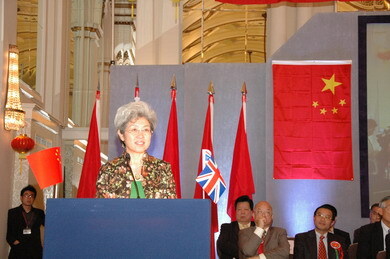 Fu Ying emphasized on the important role that the Chinese community in UK has played in the country’s 60 years of development. She thanked them for their financial support to disaster and poverty relief, firm commitment on national sovereignty and dignity, support for peaceful reunification and contribution to the spread of the Chinese culture and China-UK friendship. Fu Ying said, bilateral relations now enjoy a good momentum with deeper cooperation and new opportunities. The Chinese community in UK also enjoys favourable development prospects and opportunities. She expressed the hope for them to be more engaged in and supportive of the growth of China-UK relationship. Fu Ying thanked them for their support to the Embassy and committed that the Embassy will continue to provide assistance and convenience to ensure their welfare and preserve their legal rights and interests. Attendants from the Chinese community in UK spoke highly of China’s splendid achievements over the past 60 years, which have given them a solid basis for survival and development overseas. 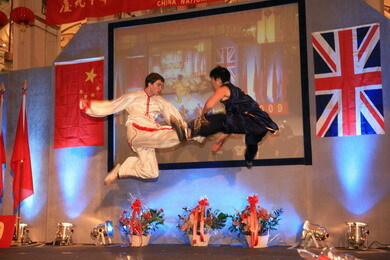 The steady growth of China-UK relationship also allows them better social status. Though abroad, they care deeply for the motherland and are ready to play their part in its development and peaceful reunification. Mr. Li Zhizhang, member of the preparation committee, said in his speech that China had achieved fast economic growth and continuous improvements of people’s livelihoods in the past 60 years particularly since reform 30 years ago. The successful holding of the Beijing Olympics and launching of the Shenzhou VII manned spaceship are symbols of its national strength and sources of pride for the overseas Chinese community. We will continue to carry forward the great tradition of patriotism and help facilitate new progress in China’s economic development. We wish our motherland even stronger and the Chinese people more prosperous. 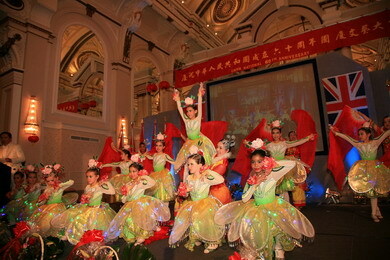 The banquet hall was decorated with lanterns, lights and flowers. The event was launched amidst national anthems of the two countries. Local Chinese societies and students contributed a wide range of performances. The event ended with the tune “Ode to the Motherland”.